Finnkino Omena in Espoo, our new seven auditorium multiplex with 847 seats and the first all-laser cinema in Northern mainland Europe opened on Thursday 20 April. Just 20 minutes by car, bus or metro from the centre of Helsinki, Espoo is the most affluent suburb of Helsinki. The cinema is located in the restaurant area of the Iso Omena shopping mall (“Big Apple”), one of Finland’s top four shopping malls. 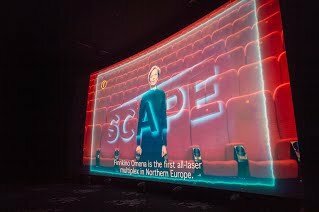 The cinema features three concepts: the largest auditorium is dedicated to Finnkino’s premium large format brand “SCAPE” and has 262 seats. 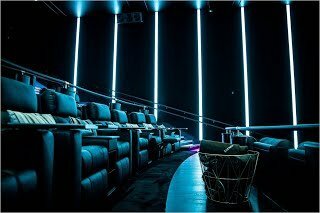 Auditoriums 2-6 feature Finnkino’s trademark red seats, wall to wall screens and Barco’s phosphor lasers. The final auditorium features a “Finnkino Lounge”, an exclusive 28 seat auditorium with recliners and the famous Finnish “Genelec” studio speaker system. In addition to the latest technology, the cinema is offering a new birthday party concept for children’s parties and an after-work bar. Guests can enjoy an interactive cinema game pre-show, played with the Finnkino cinema app.